Milton Abbey offers a stunning and scenic venue for a variety of events and special occasions including weddings, conferencing and corporate hire, residential stays and private functions. We also run our very own golf club and have an on-site tea rooms which is open for visitors to the site and Abbey to enjoy during the school holidays, as well as offering organised tours and afternoon tea packages for groups and organisations interested in learning more about our historic site. Our grounds are home to a stunning Abbey church, founded in the 10th century by King Athelstan, and an exquisite Georgian mansion house, set in one of Dorset’s most beautiful locations. We also have a fantastic range of facilities including a golf course, cricket pavilion, swimming pool and gym, sports pitches and 300-seat theatre. 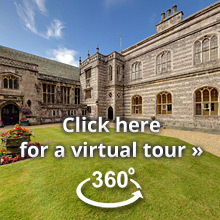 Be sure to visit our Events/Tickets page for details of the concerts, drama productions and themed lunches and dinners which we regularly host here at Milton Abbey where you can now book tickets online. We look forward to welcoming you to our special venue soon.